After exiting the Cherohala Skyway in Robbinsville, NC we stopped by the TVA Cheoah Development. This was a different kind of stop for us. 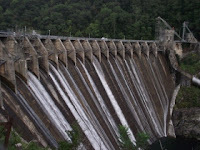 It is the only dam on our Etowah to Etowah in six hours road trip loop. Instead of mountain scenery we paused to admire the gush of water through the turbines of the TVA dam. Without realizing it you may already be familiar with the Cheoah Development. Some of the scenes in the Harrison Ford movie 'The Fugitive' were shot here. There was just enough space to pull off of the road and snap these photos of the Cheoah Development. They were taken as Hwy. 129 goes over the Little Tennessee River. It was the first of the developments to be undertaken by Tapoco and was completed in 1919. At the time of completion it was the world's highest overflow dam at a height of 225 feet.